Glamorous Gouldians is your online Lady Gouldian Finch supplies store! You can easily buy online and we work hard to deliver quickly and efficiently. We have a wide selection of Lady Gouldian Finch supplies for your pet gouldian. We have supplements, nests, nesting material, egg tweezers, professional egg candler, hand feeding formulas, fake eggs, leg bands, breeding calcium, nestling foods and more. Our Lady Gouldian Finch supplies are especially geared towards smaller birds like Lady Gouldian Finches. 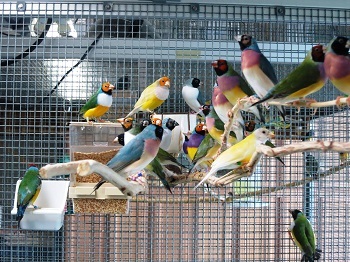 Having the right kind of lady gouldian finch supplies will make breeding your birds more comfortable and successful. RCom Mini Incubtors are great for handfeeding and keeping finches. They work as a temperature controlled incubator, brooder or hospital cage. They are inexpensive and easy to use. They control the temperature and humidity with an alarm should either drop. Easy refill for water. Need small egg tray to turn eggs if you want to actually incubate eggs. Adapter is for using in a car cigerette lighter. Great when you have to go and need to take the babies along! Can not return this item if it has been used for sterility reasons.